Hooray for Spring! Spring and Fall are my favorite seasons... you get to see all of the changing scenery and the weather is just perfect (usually)! There was a shade of blue next to it that was not quite as brilliant, but the hubby liked it better so I went with it. True to Spring, it was crazy windy outside and I was in a race against impending rain. I worked on this project over Spring Break and had to get it done, so I couldn't just wait for a later time. So I did what any respectable person would do. I spray painted under my back porch. I will NEVER do this again! LOL! My poor little back hurt so bad from bending over for almost an hour, and I whacked my head on the wood beam real good at least once. The solid white iron chair was given to me by my Father-In-Law, and the white and green iron chair was saved from the dump by my Sister-In-Law! I adore the adirondack chairs now... the hubby approves too! It did nothing but RAIN for at least three days after I finished them, but they have held up just fine! I was in a HUGE rush to finish my iron chairs, so I was bad and didn't take many in between shots. You can see one of them in the back of this picture with the wood seat cut out. After they were spray painted I had to trace out the pattern for the seat. I used wood I had left over from my bookcase project. It is similar to the wood I used on my $5 wall art. Because it is so thin I cut out two circles using my jigsaw so they would be thick enough. After the circles were cut out I glued them together with my gorilla glue and used a hand-held staple gun to staple on the batting and fabric. I'm loving my back porch and the weather!! Now I just need some beautiful flowers (not the brown kind)! Outstanding job on the chairs. love that blue so crisp and clean looking. Love the chairs, and the adrondicks are fantastic, love the color choice. Loves them...they scream Happy come sit on me. Thanks for joining my color partay. I absolutely love your blue adirondak chairs. I love that shade too! I also admire your dedication to get them done, under such dire circumstances! They are just perfect! ooh i love those iron chairs! the seats are awesome! That is a great color! Do you remember what it was called? I love those iron chairs too. The fabric you used is so darn cute! They look great! It's so funny that I posted Adirondack chairs today too! :) I love the look of them! I love adirondack chairs and I LOVE the new color of yours! Thanks for sharing! Found you over at DIY Showoff. Great chairs! 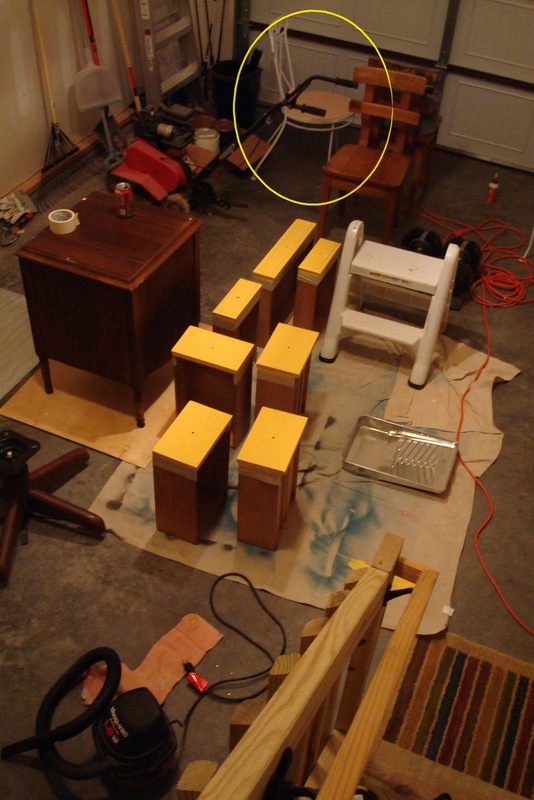 And I love garages full of furniture getting painted, just like mine! I just love the colors you used for the andirondack chairs. The fabric you used for the seats is very cute to! Visiting from Sew Chatty. Wow, I love the colors!! Great job, you should totally throw a party to show off how cute your porch is now :) Visting from the DIY party! Love the new pretty punch of color! Great job! If snow would ever stop being in our forecast, I'd be able to think about the patio. Impatiently waiting. lol Love what you're doing and look forward to seeing more! Love those iron chairs! They look great. The chairs are awesome. Love that color. Thanks for sharing at my Swing into Spring party. All four chairs are totally gorgeous!! I looooooove the colors!!!! Such a pretty blue color! Thanks for linking this up to Wicked Awesome wednesday. K, so I finally caught up on your blog. You've done a lot since I got to check last! Great job! I love the chairs, the colors great. And the metal chairs!! I love them! I love the fabric you chose, you did an amazing job. Amazing what a big change a little spray paint can make. Your chairs ROCK! Love them! LOVE them!! I painted my chairs a few years ago a navy color. They need to be redone and I want a brighter punch of color but just not sure which color to go with. Great job! Thanks for linking up! Love the transformation! I feel for ya with the whole head whacking thing. I usually hurt myself in some way when doing anything! What is the name of the color you used? I really like that! I like the fabric you used. Perfect for spring! Love the transformations of your chairs. The fabrics you used for the iron chairs are lovely and the new color for the wood ones suit spring just fine. Love these makeovers. Adirondack chairs always make me think of warm weather. Happy Friday Hugs! I love them. They all came out great. I wanted some Adirondack chairs in the same color. Ack! I am totally lovin' the blue!! Lovin these chairs! You remind me of me (spraypainting regardless of weather)! Thanks for sharing! I love the blue chairs and the little chairs too! You've been featured this week at my Hookin Up with HoH Party! Please feel free to stop by and grab a button if you'd like!